On Sunday, October 7th, World Yacht will be hosting the annual Beauty Brunch for the Cause, benefitting The Breast Cancer Research Foundation. 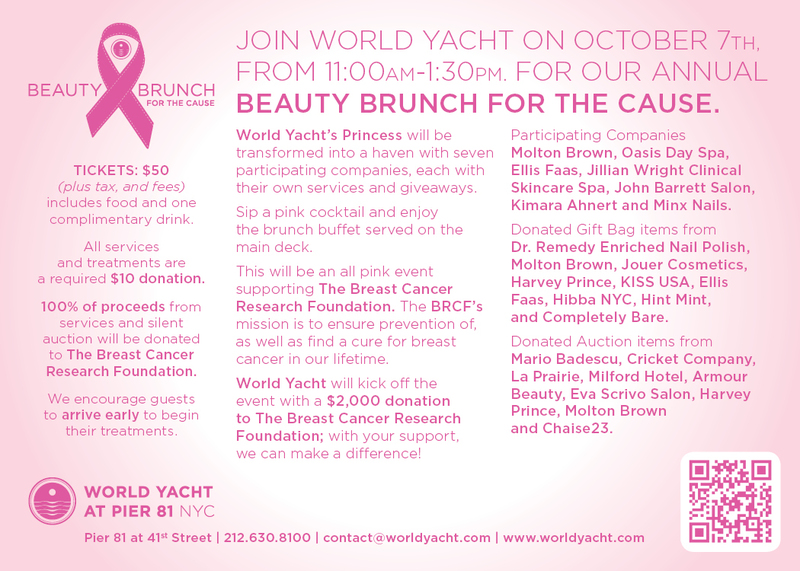 World Yacht's Princess ship will be transformed into a spa haven with participants providing services and giveaways. Participants include: Jillian Wright, Clinical Skincare Spa, John Barret Braid & Ponytail Bar, Minx Nails, Oasis Day Spa, Ellis Faas, Kimara Ahnert, and Molten Brown. Gift bag donations include items from Ellis Faas, Dr. Remedy Enriched Nail Polish, Jouer, Molten Brown, Hint Mint, Harvey Prince, Kiss USA, Completely Bare, Hibba NYC, Supergoop and Own Skin Health. There will be a silent auction on board with items from: La Prairie, Mario Badescu, Molten Brown, Chaise23, Armour Beauty, Harvey Prince, Cricket Company, Milford Hotel and Eva Scrivo. World Yacht is kicking off the day with a $2,000 donation. 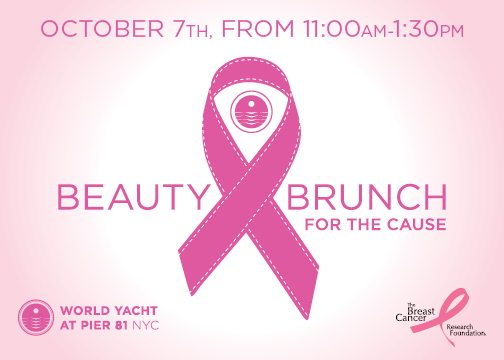 Guests will sip champagneand enjoy the brunch buffet served on the main deck in honor of The Breast Cancer Research Foundation. All services and treatments will begin at a $10.00 donation. 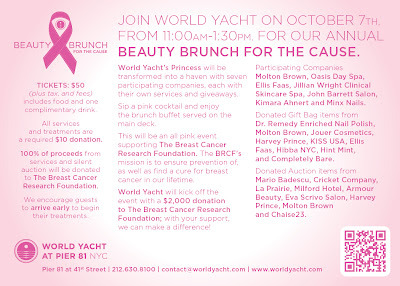 100% of the proceeds from services and silent auction will be donated to The Breast Cancer Research Foundation. To learn more and purchase tickets, go to worldyacht.com.